Boys and girls, you need to hear this. Alexandra Zerner is so good at music, it’s hard to believe she’s human. 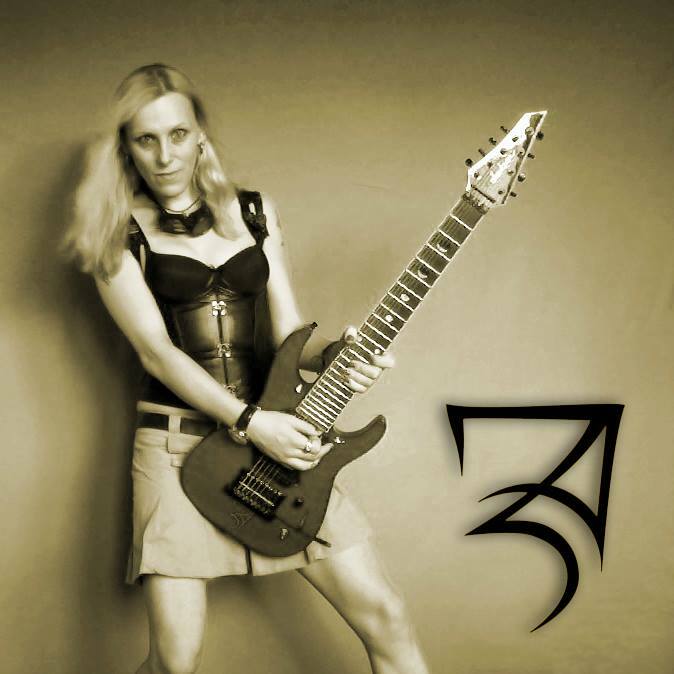 Alexandra was ranked among Metalholic’s “Top 15 Hard Rock & Metal Female Guitar Shredders”. Born in Sofia, Bulgaria, she’s a solo artist, guitar player, multi-instrumentalist and composer. 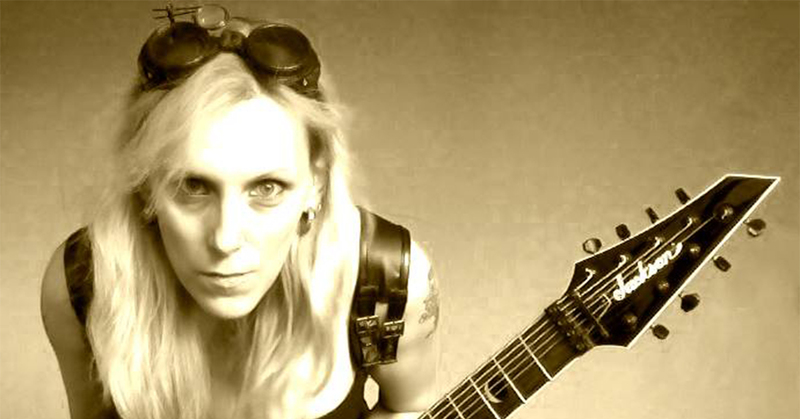 She has been working as a session musician, sound engineer and guitar teacher since 2001. 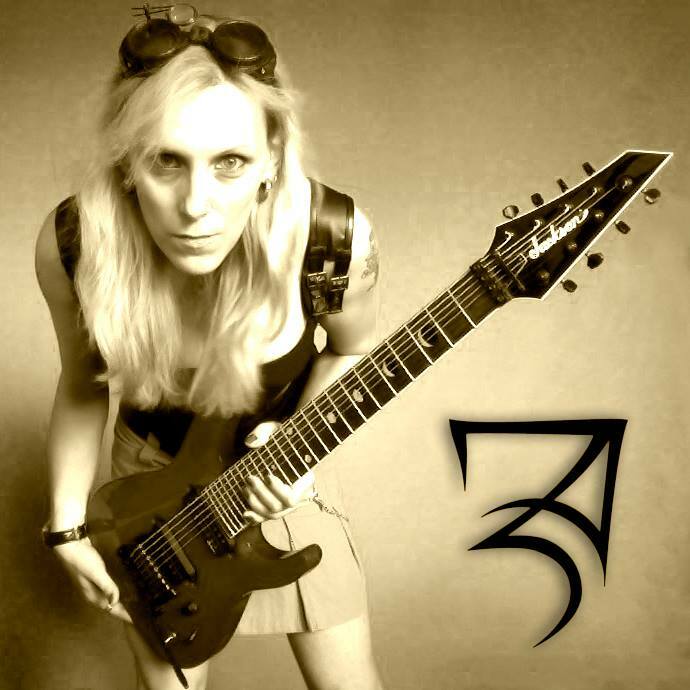 In addition to her solo career, she’s contributed with some amazing guitar pieces to We All Die (Laughing)’s album Thoughtscanning, Déhà AMSG’s Post­Rock/Ambient project Aurora Borealis, the worldwide Another Destiny Project and the ambitious Vivaldi Metal Project as a lead guitarist. Her debut solo album 9 Stories, was released in 2014 and is definitely something you should check out immediately. Her second album, called Aspects, came out earlier this year and it’s another true masterpiece. Alexandra composed every song and played all of the instruments for her two albums (except for a beautiful keyboard solo by Keiko Kumagai from Japanese band Ars Nova) and is now working on the third one – we’re VERY excited about it! Alexandra was mentioned by her guitar hero Jason Becker in the October 2015 edition of “Guitar Player” magazine, along with Jeff Loomis, about her mind­blowing cover of Jason Becker’s “Perpetual Burn”. Miss Zerner has been rocking YouTube for quite some time now, sharing songs and covers, and licks, and tricks, and teasers ALL THE TIME. Not only is she unbelievably talented but also one of the most productive musicians we’ve ever come across. Hey, Alexandra! How would you describe your style? Hey! Basically, it should be categorised as a progressive metal, so far instrumental one, but I tend to dive in and explore many musical genres, borrowing different components from them, so I can have nice and interesting colourful bricks to construct my own musical soundscapes the way I feel they need to be, and being a session musician and a production music composer helps me a lot in getting familiar with a wide variety of genres. But despite all that, I gravitate around the progressive metal, because it offers a versatile matrix, where I can combine random ingredients, even eclectic and contradictory ones, and finally still render a nice and interesting result held together as a musical composition. Thus, I do not fear to mix low tune metal riffs with gypsy jazz components, or odd meter time signature grooves with purely classical chord progressions and melodic lines, e.g. When did you find out music was your thing? When I was 8 and I was still in the beginning of my guitar playing journey, I wasn’t very dedicated and used to get distracted easily, like every other child at that age I guess, and my mom apparently had been disturbed by that behaviour, because her actions then led to my life altering experience, concerning my attitude to music. One day I found that my guitar is missing and I started looking for it all around the apartment and I couldn’t find it anywhere. After searching over and over again the same places with no result, a terrifying feeling started to emerge – I thought that my mom probably had thrown my guitar away. Suddenly I felt so devastated, that I burst into tears. Then my mom pull out the guitar from somewhere and gave it to me, I grabbed it and held it tight, and this was the moment, that I realised I will never leave it. Later I started playing other instruments as well, because I was already seriously involved with music and I wanted to understand it at every level and aspect possible, but the guitar remained my first and eternal love. How would you introduce yourself without mentioning anything about music? If someone ever put me to work on a desk on a nine-to-five job, or worse – put me on a position, that involves talking to a lot of people, I will run as fast as possible. This pretty much sums up the outer layers of my personality. Broadly speaking, I am an anti-social introvert and maybe this is one of the main reasons I’ve been deeply drawn into arts in general and consider myself as a highly creative person. I am a passionate book reader, an observer, and a listener, which provides a huge amount of events to inspire me. I like to explore the deepest levels of everything around me, and find what’s beneath the surface, what is the secret mechanism that makes the Universe behave in this particular manner, and I am satisfied when I find structures and patterns in it. I am also very attracted to the abstract and spiritual side of Life and what’s beyond the purely physical existence in a non-religious aspect – I think it makes me an atheistic agnostic person. Also, I am left-handed, despite that I play as right-handed, I am a non-drinker, non-smoker, a loner and mostly vegan, or briefly said – a boring person. The rest of me is the term, that I am not allowed to use in this answer. Name a few of your music heroes. Jason Becker, Marty Friedman, Yngwie Malmsteen, Tony MacAlpine, John Petrucci, Joe Satriani, Django Reinhardt, J.S.Bach, Antonio Vivaldi. How and when did you first get into music? I’ve always been exposed to a severe amount of great music, even before I was technically born, and when you’re constantly swimming in such substance for the first few years of your existence, it’s very likely to be fascinated by the idea of playing an instrument – it gives you a deeper understanding of the music’s matter and makes your connection with it stronger and multi-layered. When I was 7, my cousin started playing guitar and when I saw her playing, I knew that I want to do the same thing, so I started whining to my parents until my desire was fulfilled and I got a guitar. Where do you get your inspiration besides music? I’ve always said, that the music is a complex and high-level language, so I make music for the same reason people talk – I need to express what I see and feel around me, and inside me as well. And due to my ability to capture simultaneously many layers and details of the full picture, along with its structures, I use the music instead of words to form and express my thoughts and emotions, because the spoken language turns out to be handicapped, when it comes to transmitting such streams of information to other people. So, speaking of inspiration – I am inspired by everything that happens around me and affects me on a substantial level. What do you do when you’re not playing or writing a song? Usually reading a book, watching a movie, cooking, exercising or doing some yoga… or sleeping. I rarely go out because of my highly introvert nature, also I can’t stand crowds and noisy environments, so I am not that type that you could see at a party or a bar. People often ask me how I play on stage with these issues, which is a logical question, I must admit. Well, the answer is that when I play, I move to another dimension, so the problem is solved. It all starts with an idea – a melody, that emerges in my mind, and it usually comes with a harmony and some concept for a groove – I guess the years of music education and practice led me to this point, where I can effortlessly extract semi-composed chunks directly from my mind. The next step is to open a recording software and start developing the idea, while it’s still hot – I form structures, polish the details using my theoretical knowledge, add instruments and do a demo, so I can have a material to listen and analyse, and then decide if it’s worth it to continue working on it. Luckily, it usually do. I’ve been asked why I don’t write down my ideas at the moment they pop up – I empirically discovered, that if a musical fragment appears and on the next day I can easily recall it – it’s good, if I don’t remember it – it’s not. I came to this conclusion after a long period of writing down everything that has come across my mind, and the natural selection has shown me that there is no point in writing down – my mind is the best judge in the given situation and it keeps my brain clean and organised, thus giving me more resources to process the new music, instead of wandering inside a pile of random musical fragments with controversial quality. Alexandra’s first album ‘9 Stories’. Check it out! What are you looking for in a song? What’s your “thing” in music? There are a lot of things, that could catch my attention in the music, but I think I am most sensitive to how melodies, beats and harmonies are bound together. It’s like looking at a painting or a building – it’s either beautiful and harmonic, or it’s not. Same is with music, but with the clarification, that „harmonic“ doesn’t necessarily mean 100% consonant composition in common time signatures. I can see as much harmony in the composition of bands like Death, as I see in Baroque music while in purely consonant and tidy pop songs I see nothing – just heartless rectangles, put one over another. Music gave me a different perspective on Life in general. It showed me the delicate tissue of the non-verbal communication and opened my mind to a whole new world of sensations. Few people know, that I am actually a synesthete and I perceive music with more than just one sense – I see colours in it, sometimes smells… I would probably never find and develop this feature of mine if I didn’t dive into this eternal ocean, called Music. Your second album “Aspects” just came out. How is it different from the first one? Both albums are instrumental works, but there are some major differences. The first one – „9 Stories“ – is based on nine books and movies with similar concepts in their plots. They all affected me deeply and, therefore, they served as very interesting and inspiring material to experiment with, and then represent in a musical form. My second album „Aspects“, on the other side, is based on my personal experiences with different kind of relationships, that had a great significance in my life, which I analysed, categorised, and expressed as music. As a matter of fact, „Aspects“ is a bit more metal, considering the overall sounding and the tracks are connected, the whole album can be listened to as a single piece. What’s next for you? Should we be expecting anything exciting soon? I already started working on my third solo album, which will be another level up – it will contain vocals, a wider variety of genre influences, more instruments, I also plan it to be longer than the previous albums, which are about 45 min. each. The new one should be around 70 min. and will be conceptual work again. Meanwhile, I plan to start doing gigs with my new band, that I gathered in order to present my music live. What’s your advice to our readers? I am kidding. Actually, I am not kidding, because playing quintuplets is an important ability and it has a bigger meaning than it seems – it teaches my students to think outside the box, because they’re usually stuck in the 4/4 world, due to how most of the music is being done. Music is a multi-dimensional experience and it’s a crime to imprison yourself in a small cube and never get out of there. Another essential thing I teach them is that it’s very important to be precise, literate and in a good technical condition in order to be able to translate all of your ideas into a sound, and to do it properly, with a good taste. Playing messy and without a sense of harmony or rhythm should be a matter of choice, not an inevitable boundary, caused by laziness. Big Thanks to Alexandra Zerner! Check out her channel, find her on Drooble and perhaps get some incredible lessons?